This 232 carat diamond came from the Cullinan mine in South Africa. 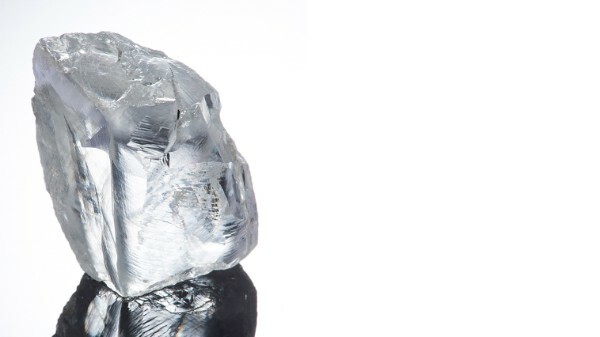 A diamond fragment from the same mine contained a calcium silicate perovskite inclusion, confirming the existence of this mineral, likely the fourth most abundant mineral on Earth. Read more about the discovery here. March roared in like a lion with the publication of an exciting paper from DCO’s Diamonds and Mantle Geodynamics of Carbon group in Nature. The paper, from Reservoirs and Fluxes Community members Fabrizio Nestola (University of Padua, Italy), Graham Pearson (University of Alberta, Canada), and colleagues, confirms the identity of a pocket of calcium silicate perovskite in a diamond that formed 780 kilometers below Earth’s surface. This is the first direct observation of Earth’s fourth most common mineral. A new study from Extreme Physics and Chemistry Community members Susannah Dorfman (Michigan State University, USA), James Badro (Institut de Physique du Globe de Paris, France and Ecole Polytechnique Federale de Lausanne, Switzerland), and colleagues suggests that slabs of subducted surface material may reach the core-mantle boundary bearing diamonds and marble. The work is published in the journal Earth and Planetary Science Letters. Recent meetings and workshops have kept the DCO in high gear. In late February, DCO co-sponsored a symposium at Rice University, USA that convened representatives of academia and industry to explore whole Earth carbon cycling as a topic of mutual interest. In mid-March, the Center for High Pressure Science and Technology Research (HPSTAR) Director Ho-Kwang “Dave” Mao organized the Deep Volatiles, Earth, and Environments Summit with sponsorship from DCO and the Chinese Academy of Engineering. The summit, held at the Shanghai Synchrotron Radiation Facility in Shanghai, China, attracted over 170 participants, many new to DCO. Following the summit, the DCO Executive Committee met at HPSTAR. And just last week, the DCO synthesis project, Earth in Five Reactions, brought 50 scientists to Washington, DC, USA for a workshop to identify the carbon-based reactions that make Earth unique in the solar system. Please note a few deadlines that are fast approaching. Abstract submissions for Goldschmidt 2018 are due on 30 March, AGU 2018 Fall Meeting session proposals are due on 18 April, and applications to participate in core logging activities as part of the Oman Drilling Project are due on 30 April. Also, the inaugural Gordon Research Conference on Deep Carbon Science is accepting applications until 20 May; I encourage you to apply early to ensure your place at the meeting. Lastly, keep an eye on the DCO website in the coming weeks; we will unveil its new design in April. The pace of DCO discovery and publication promises to keep accelerating. The EGU General Assembly 2018 will bring together geoscientists from all over the world to one meeting covering all disciplines of the Earth, planetary, and space sciences. Early career scientists are invited to attend a training school on thermodynamic modeling of natural silicate liquids and their equilibria with minerals and fluids, from atomistic to macroscopic scales. Registration now open.